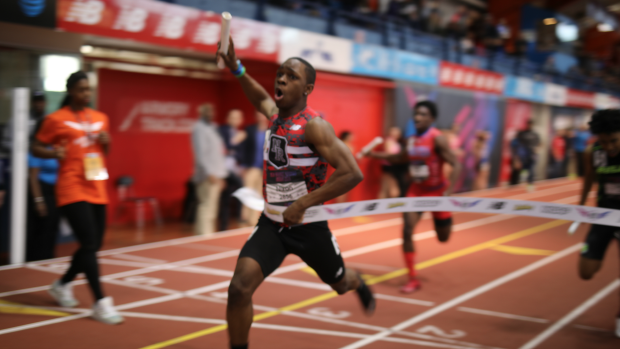 Nansemond River Warriors Come From Behind For National 4x2 Title! NEW YORK, Ny. - The Warriors of Nansemond River continued their trend and won their school's third 4x200m relay national title in a row. The team of Jevon Waller, Daiqwaun Faircloth, Kevin Johnson and Jacob Nixon teamed up to run 1:27.11 for the win. Waller opened up for the Warriors and handed off to Faircloth. Faircloth carried it to Johnson and then Nixon brought it home in dramatic fashion where he came from third to first in the final 100m. The biggest story here aside from that huge anchor by Nixon was Faircloth being able to run. He rolled his ankle the night before after his national record anchor on the Mixed 4x4 and was a race-time decision. The girls finished second in 1:36.35. That time tied the previous meet record and is a Virginia State Record. They have been first, first, and now second the past three years.